Normally, seeing a vehicle speed down the road on its roof would be cause for a 911 call – but not when SpeedyCop is behind the wheel. The 40-something cop, also known as Jeff Bloch, is known for making some truly crazy vehicles. 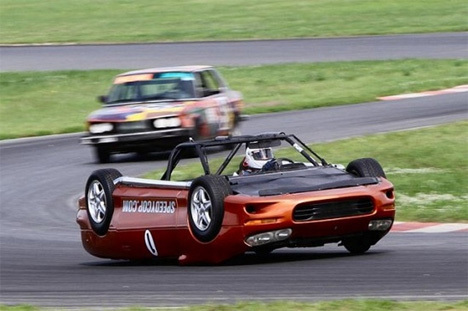 But this upside-down Camaro might be the weirdest yet. 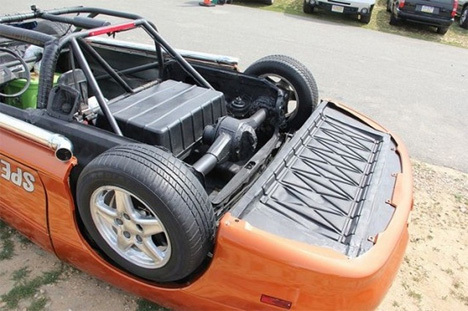 In making the unusual ride, Bloch mashed up a 1999 Camaro and a 1990 Ford Festiva, using parts from both to bring the upside-down racecar to life. According to the creative cop, he is just an 8-year-old boy in a 40-year-old body, which explains why he creates such wacky driving machines. It’s not just for show, either. Bloch took this crazy car on the race track for the 2013 Spirit of LeMons race, an event that pits crazy, beat up or just plain odd cars against one another. See more in Art Vehicles or under Transportation. September, 2013.